Dramatic skies over the Calgary cityscape in the morning, including the new Bow building towering over the surrounding highrises. 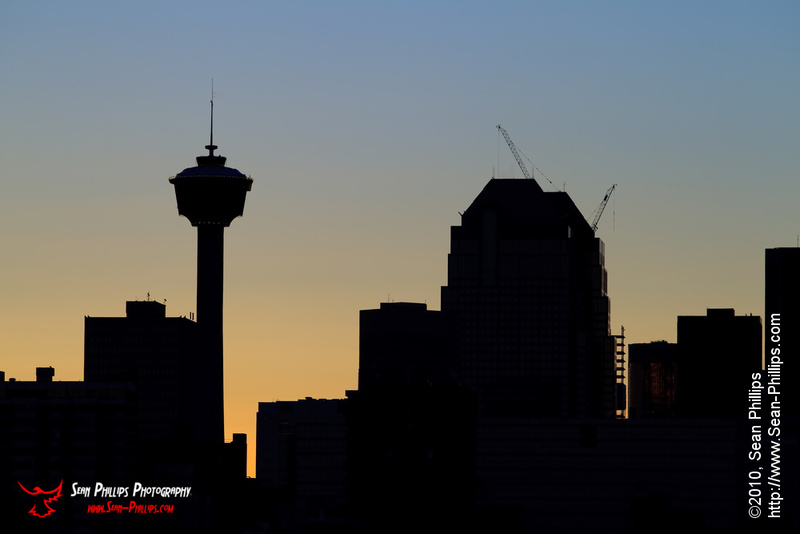 The unmistakable shape of the Calgary Tower stands out against the golden sky during the magic hour shortly after sunset. I’m a bit of a sucker for skyline pictures anyway, but the light was really dramatic, so of course I had to pull over to make this image. The entire region surrounding Calgary has been blanketed by a heavy ice fog for a couple of weeks now and I really wanted to make some images to capture the look and feel. It has been very surreal and haunting, and downright scary at times with the fog being so thick. I had visions in my head of images that show off the thick snow and ice that was coating everything. I’m not entirely sure I succeeded in that goal with these images, but I am really happy about them anyway. 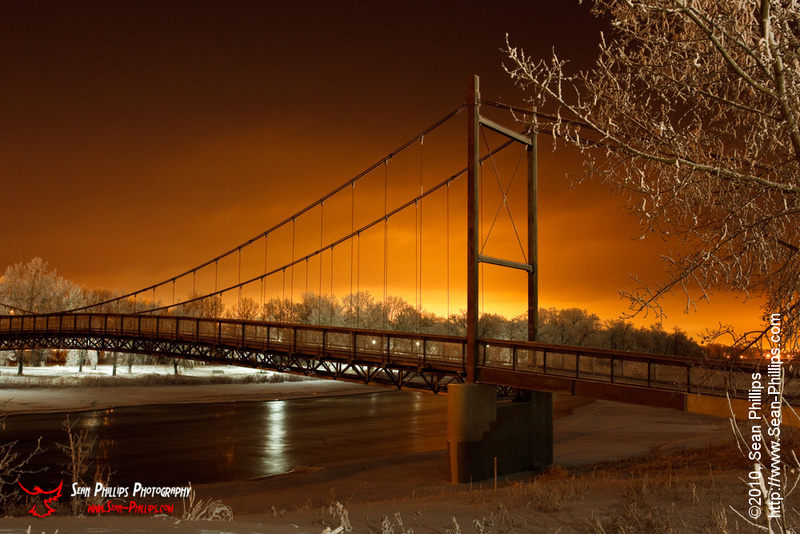 These are Long Exposure night shots from Centenary Park, which is just East of Downtown Calgary. 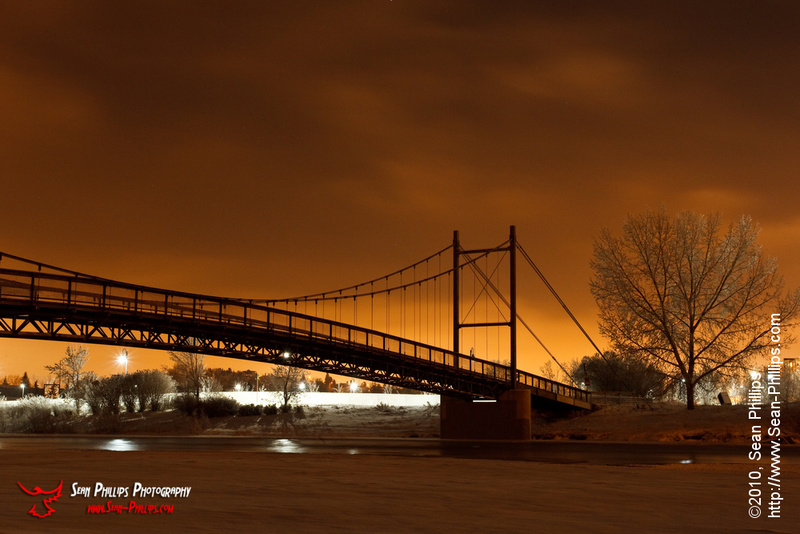 This is the GC King Pedestrian Bridge that connects St. Patrick’s Island to Fort Calgary and downtown. 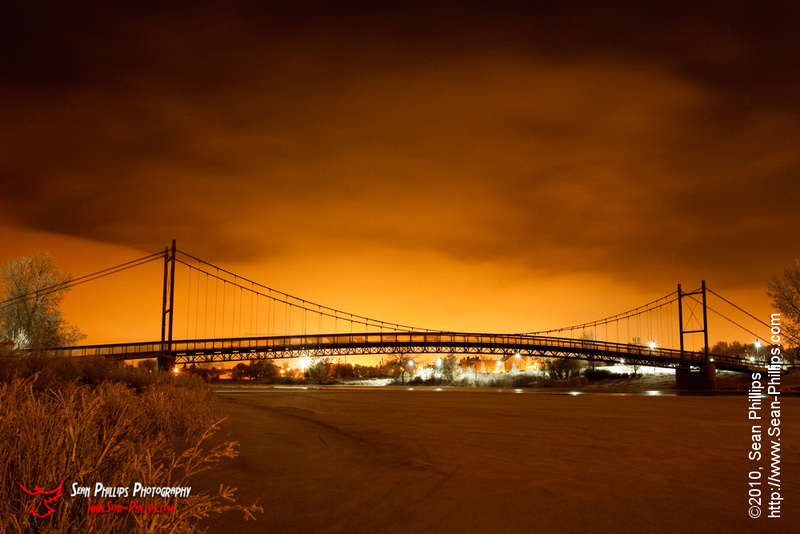 I’ve wanted to shoot the bridge for a long time, but I never quite got around to doing it. 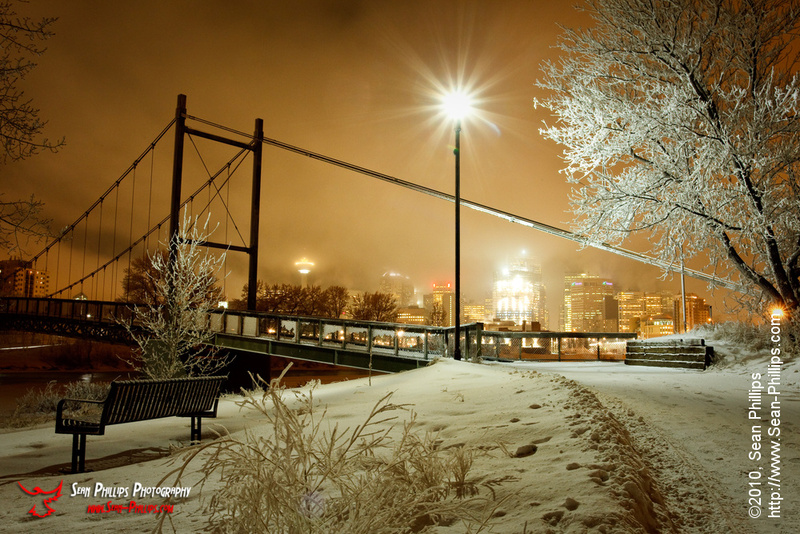 It’s a beautiful old bridge and the glow of the city lights against the clouds and the frosty trees really made it pop. This bridge is due to be replaced by a new and fancy designer bridge at some point in the next couple of years, so I’m really glad that I was able to make these images. 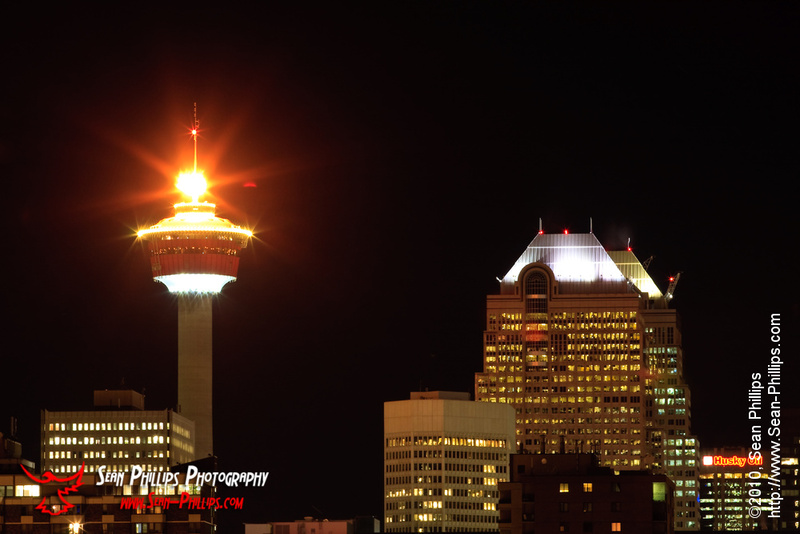 I went downtown the other night to try to make an image of the cityscape while the Olympic Torch on top of the Calgary Tower was burning. The flame was lit in honour of the Olympic Torch relay run passing through Calgary while enroute to Vancouver for the 2010 Winter Olympic Games. Unfortunately I only had time to make a couple of close-up images of the Tower itself before the flame went out. Since I was already there I took the opportunity to make a new panoramic image of the skyline. I’ve made quite a few images from the same spot over the last couple of years. I really love the look of the city lights reflecting on the ice covering the Bow River, so I really prefer to make these images in the winter. Well I’ve been pretty much overwhelmed by life and other pursuits this week and haven’t found the time to process all my images, never mind prepare any blog posts about them. The coming week doesn’t look to be any better and I’ll be preparing for a family vacation for the following week. I hope to get a few posts prepared in advance before we go, but I can’t promise anything. In the mean time I wanted to share a link to some amazing Prairie Falcon flight images posted by Calgary area nature photographer Rob McKay. I’ve posted about Rob’s work before and since then I have come to realize that he is a master of photographing birds in flight. The main image in the gallery he posted today is absolutely incredible. I see Falcons pretty regularly in my travels but have never had an opportunity to make any images like these, so that makes them even better!